Darwin’s mangroves appear to be fighting back against climate change, but it is unclear if the spindly plants will win their unique race to grow above rising sea levels. Mangrove forests are mostly found in the subtropics and grow in the tidal regions between land and sea. More than 40 per cent of Australia’s mangroves are found in the Northern Territory, with Darwin Harbour’s 20,000-hectare system supporting many species of fish, crabs, birds and even the odd possum. But the harbour’s mangroves have been under threat by an annual average sea level rise of 8.3mm. This sea level rise is one of the highest in the world. 8.3mm a year? So water isn’t flat any more, but is forming mountains of water over the Darwin Mangroves! 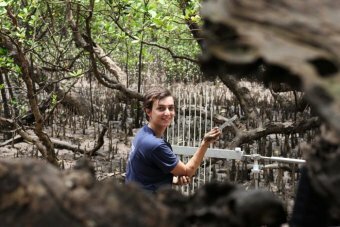 Charles Darwin University researcher Madeline Goddard has spent the past two years studying the Top End mangroves’ response to this ongoing threat. “They protect us from storms, they trap sediment, they provide a nursery for fish,” Ms Goddard told 105.7 ABC Darwin. Ms Goddard said the plant had a unique ability to literally elevate itself above rising water levels over extended periods of time. Mangroves do this in several ways, including by building up muddy sediment around their exposed roots and by growing themselves towards drier ground. “They can, under certain scenarios, push towards land,” Ms Goddard said. Her research has so far found that Top End mangrove systems were displaying this behaviour. “There is a bit of elevating gain and that seems to be in pace with sea level rise,” she said. Mangroves around large population centres are always on the move, being cut down, growing back numerous times over the past couple of centuries, as land use changes. Broome once had a lot of mangroves, all cut down and replaced with beached pearling luggers, now replaced with mangroves once again. Still in the same spot. This entry was posted in Broome/Kimberley, Climate, comedy, Environment, science, weather and tagged ABC, charles darwin university, climate, climate science, comedy, darwin, Madeline Goddard, mangroves, nature, politics, research, science, tidal movement, weather. Bookmark the permalink.